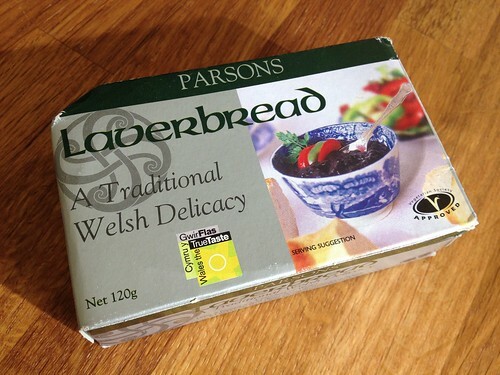 The definitive tinned laverbread, or at least the only brand I ever see in Cardiff. The lavercakes recipe on the back of the pack is also delicious if scones aren’t your thing. And just 3 months later we’ve finally gotten round to making some. I’m not usually the star scone baker in the house as Heather is usually in charge of making the wholewheat and blackberry scones that we make a few times a year, using up the stash in the freezer. She has a brilliant sweet scone recipe from my mother in law for those but we don’t really have a reliable savoury scone recipe. I have made mini cheesy scones for the Capital City Roller Derby team, with a version of Delia’s savoury scone recipe, but those aren’t the best I’ve had. I wanted our laverbread scones to be up to Pettigrew or Lovecrumbs standard so started scoping out options. The finished scones – golden and crisp on top, deliciously speckled with greed seaweed inside. In a large bowl (with very clean hands), gently rub the flour, butter and lard together to form a course breadcrumb texture. Get lots of air in – I tend to rub and lift to get lots of air circulating. 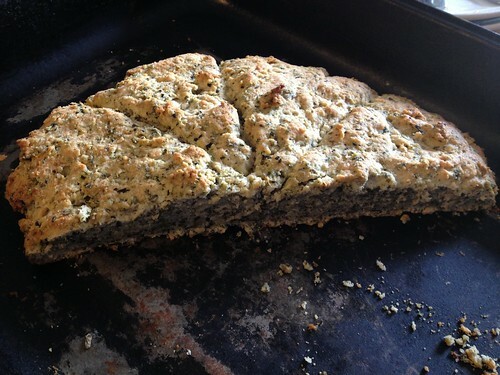 Add the laverbread – just tip the whole tin in – and stir with your hands. The texture of laverbread is quite jelly-like (it is seaweed after all) so you’ll need to kind of rub that in as well, again getting lots of air in if you can. Once everything is well mixed add/grate in the cheese, along with the salt and pepper. Stir quickly and lightly by hand. You should now have a fairly soft large breadcrumb like texture. Add some milk to mix into a dough, after some gentle mixing add a little milk in as needed. You should now have a soft dough, a bit like biscuit or soft bread doughs. Be very gentle with the dough at this stage to ensure maximum fluffiness. Place all of the dough on a large baking sheet and very gentle spread by hand so you have a 1.5 inch height roughly round shape. Use a knife to divide your giant scone into an appropriate number of smaller triangular scones. The Guardian/National Trust recipe specify’s this as a recipe for 12 scones but I divided our giant scone into 8 generous breakfast scones. Bake at 190° C for 15 to 25 minutes until well baked and golden. The scones will have a lovely crisp crust and taste delicious warm with butter, or with bacon and poached eggs. Perfect for St David’s Day tomorrow too! 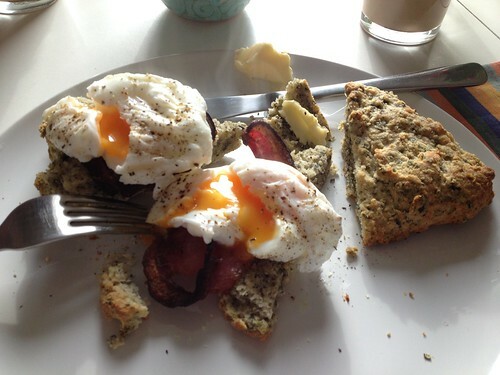 A delicious brunch: laverbread scones, Ballencrief Rare Breed middle bacon crispy from grilling, poached free range eggs and a good grind of pepper. With a wee bit of extra butter on the side for that second scone!